Each SYLVANIA SMART+ Outdoor Color Gardenspot Starter Kit allows for millions of color combinations ideal for holidays, parties, and decorative accent lighting outdoors. 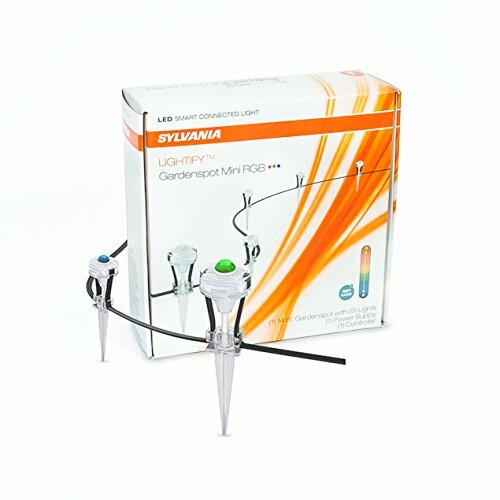 Each Starter Kit includes 9 lights (14 feet of coverage) along with a power supply and control module. A compatible ZigBee hub is required to control these lights. Pair your Gardenspots to a compatible ZigBee hub such as SmartThings , Wink, or Amazon Echo Plus. ZigBee Garden Lights: Whether you forgot to turn a light off or want to turn your lights on before you come home from work, you can monitor your lights right from your smartphone and create schedules and automations to fit your daily routines. Smart Home Lighting: Integrate voice control by pairing an Amazon Echo or Google Home smart speaker to your compatible ZigBee hub. Enjoy the benefits of hands free lighting control by asking to turn the lights on and off, dim, change the color and more. Individual light atmosphere - RGB LED: Choose from over 16 million available colors. Wet-rated for outdoor use: Starter Kit contains power supply, control module and 9 Gardenspot lights for up to 14 feet of total coverage. Maximum suggested length is 28 total feet (via extension kits, sold speratately). Removable stakes for mounting on decks, siding, etc. If you have any questions about this product by Sylvania Smart Home, contact us by completing and submitting the form below. If you are looking for a specif part number, please include it with your message.